Gorgeous! 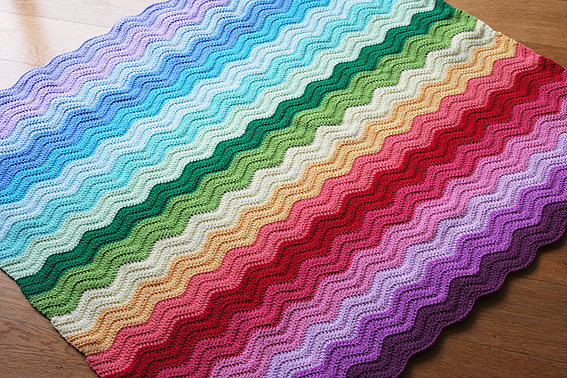 I love ripples and the rainbow makes it even better! that’s very pretty. I love all the colors – it would go quite nice in any room or living space. Perfect for an over sized throw also. Oh wow! I am absolutely in love! 🙂 This is amazing… I actually picked up a very similar blanket at an op shop last week. 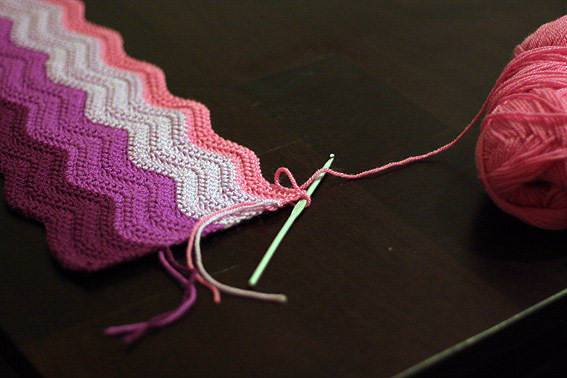 I would love to learn to crotchet… this is just divine! Lucky find! 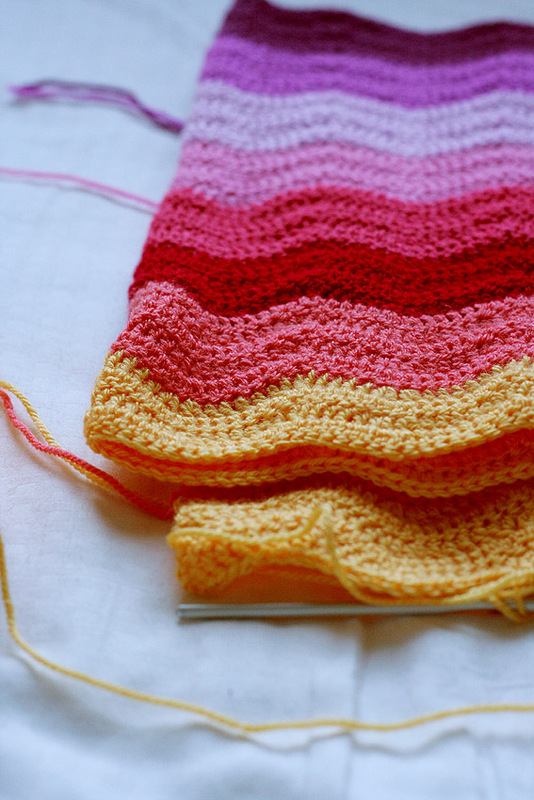 Crocheting is definitely fun and not too hard to learn. I learnt only a few years ago. I had one lesson, and then used YouTube and books to help me figure it all out. I love your colors. What size did you make it? 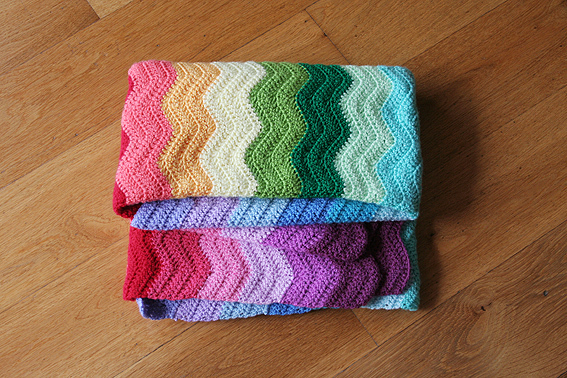 I am thinking of making something larger than the regular baby blankets I make. Did you use wool? I have a new collection of acrylic yarns about 40 colors I can use but I am thinking maybe I should try wool to really make it an heirloom. I think it’s about 105cm x 95cm. It’s acrylic, but still nice and soft. i just love the acrylic colours available. 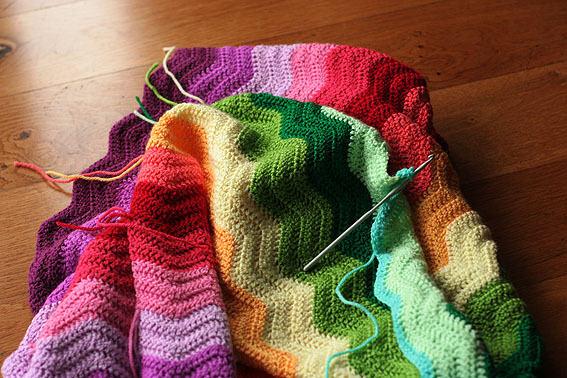 Would love to see your finished blanket. This is so beautiful!! Just amazing. 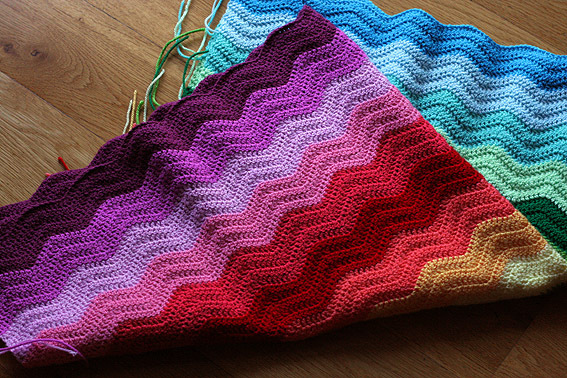 I have a question, I’ve tried this pattern about a dozen times but after the fourth row I always lose the ripple so can’t go any further. Do you have any tips? Thanks! How fustrating to get to the fourth row and have issues! I’m not sure why it is happening, you can email me a pic if you like, I might be able to spot it. Some tips – Make sure you start each row and finish each row with an increase. The first curve of the ripple should always be a decrease. Same for the last curve in each row. Your foundation row should be a multiple of 14, plus three for turning.This extra three forms part of your first increase as below. Turn and begin again as above.